This very blog is listed (at no. 77) among Online School's 100 Best Book Blogs for Kids, Tweens and Teens. obviously not abstract, being a translation of a story originally in words. but if you took the subtitles & IS & HAPPY away, very few humans could read it, therefore bringing it back towards abstraction. 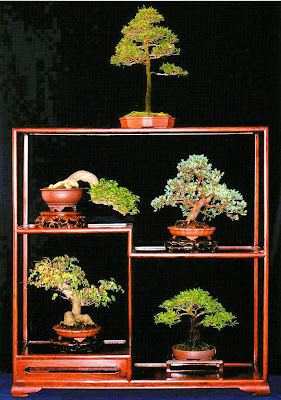 this is a photo of a frame full of penjing (Chinese miniature tree and rock landscapes), by Cao Hua, which was part of an exhibition by the Singapore Penjing and Stone Appreciation Society. (scanned from the book Bonsai Master Class, by Craig Coussins [D & S Books, 2006]). which way does the energy flow in this composition? 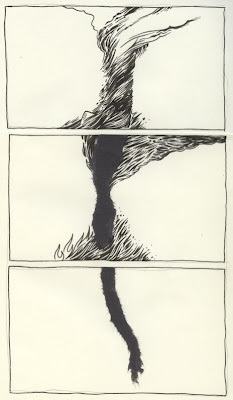 is there a sequence, comparable to abstract comics? 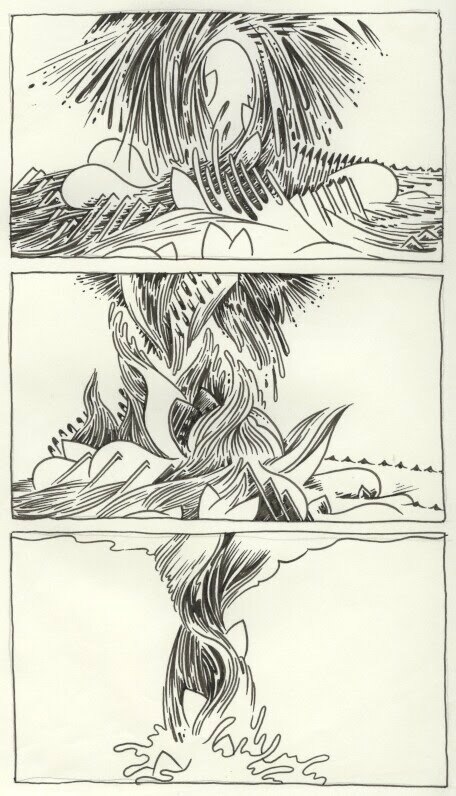 there's a sensibility in Asian artforms such as penjing, bonsai, bunjae, gongshi, hon non bo, tieu canh, suiseki & so on, which could be incorporated into abstract comics. it is generally thought in the West that if a styling is an abstract form, as opposed to a recognized form, the tree is a penjing. John is an associate professor of graphic design in the University of Illinois at Urbana-Champaign College of Fine and Applied Arts and, with Damian Duffy, co-author of the graphic novel The Hole. Catherine Spaeth, a NYC art historian and critic, did an interview with me here. We go in depth into issues of the aesthetics of abstract comics (and comics in general), the relationship between abstract comics and abstract film, on one hand, and abstract art on the other--but a large part of it is about my own approach to art rather than about the anthology or abstract comics in general. Very occasionally I try to do a comic with a specific formal agenda. In this case the objective was to produce something that was completely abstract but also definitely sequential, and to do it entirely by hand. The production involved tracing repeatedly from a master pencilled panel, which I reworked between each frame. While I met the technical requirements I set for myself, I don't think it's particularly interesting as a comic, because the transitions between panels are very rigid and simple. It could just as well be a series of stills from an animation. Issac is the current editor of the long running New Zealand anthology Funtime Comics. 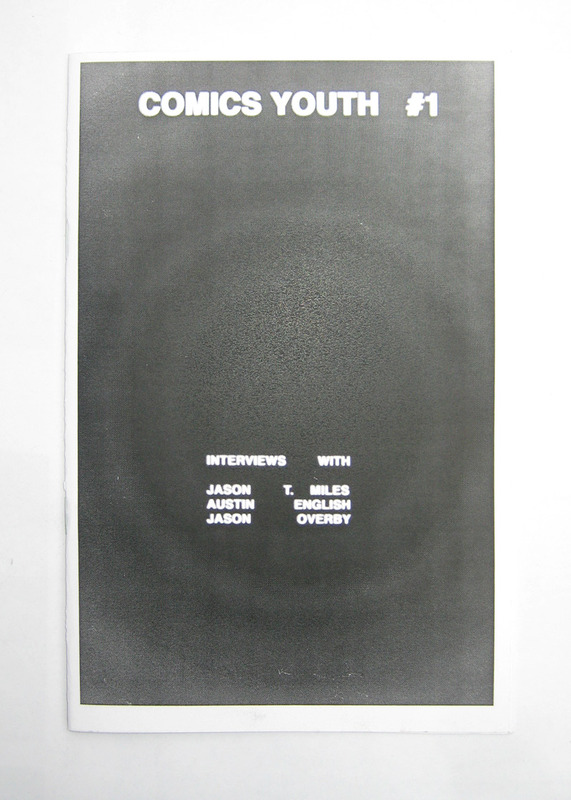 Interviews with Abstract Comics contributors Jason T. Miles and Jason Overby, as well as Austin English. A bitter, fault-finding (and -inventing) review of the anthology at du9. Stepped on some toes, I suppose? 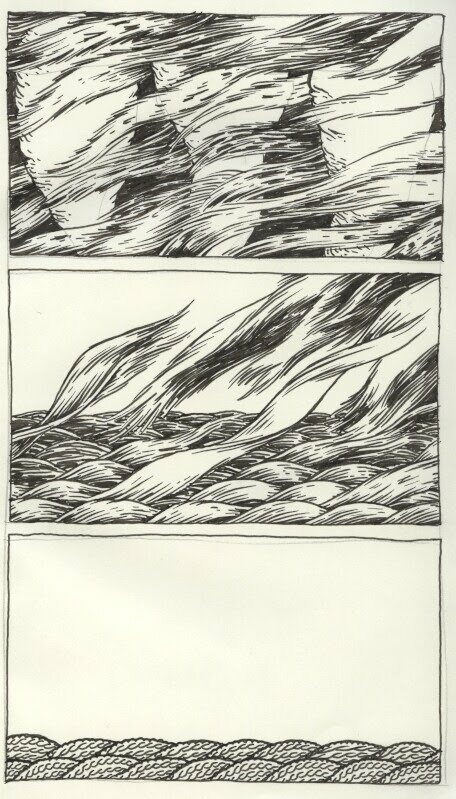 This was made for an anthology of minimalist comics called OM which was being compiled by David Lasky and Davey Oil back in 2003. From Brazil, I think, here. One of the major releases this year, still unpublished in Brazil, is the anthology Abstract Comics, launched by the North American publisher Fantagraphics. 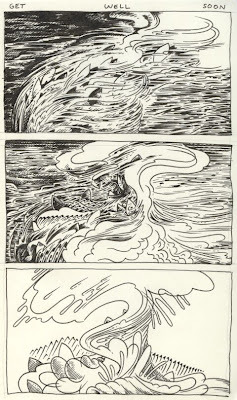 Organized by Andrei Molotiu, the album brings together abstract comics produced by a number of artists between 1967 and 2009. In practice, this means that instead of recognizable figures, like dolls and houses, the narrative is constructed from abstractions - as in a painting by Kandinsky or Pollock, for example. The first milestone in the book is the comic Abstract Expressionist Ultra Super Modernistic Comics by Robert Crumb which had already been published in the journal Zap Comics # 1, 1967 - and only flirts with pure abstraction, because there are many panels that are clearly figurative. In the introduction Molotiu - himself a major abstract comics creator - relativizes the date citing examples even before Crumb, as is the case with illustrations by Russian artist El Lissitsky, created in 1920 for a children's book about two squares. 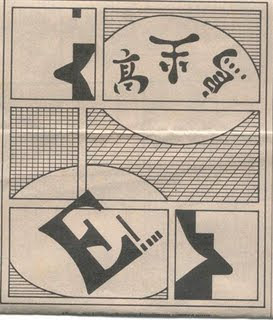 And even pages of Marvel comics bring examples of abstraction older than the Zap Comics # 1. For example, the book recounts a story of the magician Dr. Strange drawn by Steve Ditko in June 1965. The fact is that comics have always had an abstract artistic potential - and as far as my memory goes, one that is accepted by all worthwhile theoretical definitions of comics. But, until now, its role was secondary, relegated to isolated experiments. 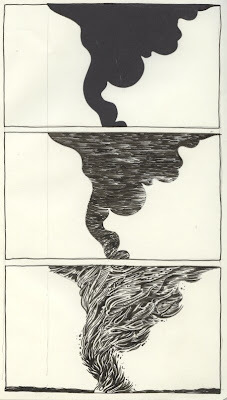 It is here that the anthology does its job: presenting an overview and organizing it, Abstract Comics creates a movement. From it, abstraction in comics can move beyond an experiment and become a legitimate possibility - a process that began in the visual arts years ago. The impression that the role of a book goes beyond: it can take several closet abstractionist and inspire other designers to abandon - even temporarily - the picture. And here for us, makes you want to see abstract works of many people just to know how it would be. Just to give a taste, I leave a short list for provoking the imagination of the reader: Craig Thompson, Laertes, Milo Manara, Art Spiegelman, Angeli, Frank Miller and Guy Delisle. I've been working on a series of sequences (so comic strips, actually) as planning for several new stone lithos which will be leporellos, yet also I am working toward "gallery comic" installations as well. 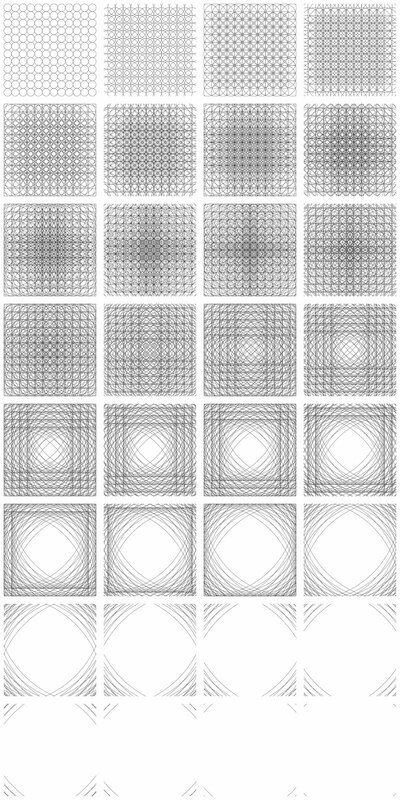 I'm attempting to make them ride the line between apparent abstraction and loose representationalism. Hence, as my art school profs would have it, they are indeed abstract, at least abstracted, but not fully non-representational. My work of this nature is usually quite large and the surfaces are very haptic, so scale and surface enter into it as well: due to them, many people do not notice any representations at all. Reproduced small, as on this website, the impression is of course quite different, but I very intrigued by the idea of flirting with but defying full abstract AND full delineation. I initially started doing abstract comics for my college newspaper. 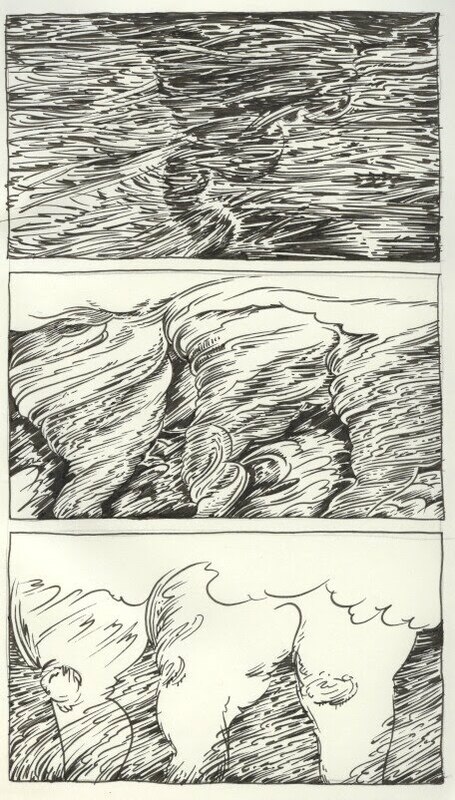 My biggest concern when I came up with the idea to do abstract comics (not that I was the first to come up with them, only the first to my knowledge) was that they would not be viewed as comics, but rather viewed as something like an abstract triptych or other work of art containing multiple images. 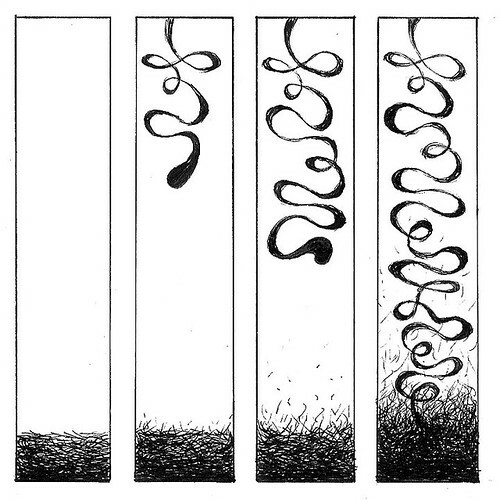 I thought Scott McCloud did a very good job defining comics in Understanding Comics and I thought one could do abstract comics without breaking those boundaries. To totally do away with the boundaries of the definition of comics would make the term comics meaningless. What I wanted to do, was show how much wider the interpretation of that definition could be. I was very lucky that my work was printed in a newspaper on a page clearly marked "Comics" this allowed there to be acceptance from the viewer that they were in fact looking at something intended to be a comic. With my goal in mind I came up with a few boundaries for myself. 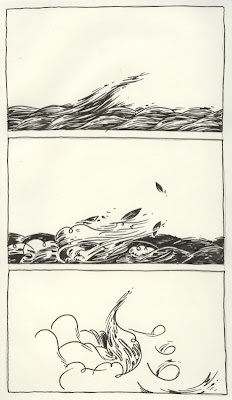 I wasn't going to do any non-sequitur abstract comics. 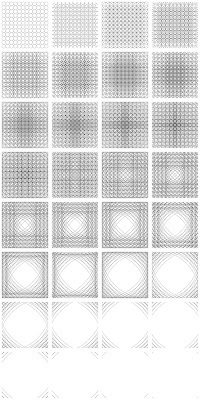 To do so seemed no different than making a bunch of unrelated abstract images and arbitrarily putting them in a sequence. Now I believe that if one were to do just that they would in fact have an abstract comic on their hands, but this did not serve my goal of widening the perception of said definition. 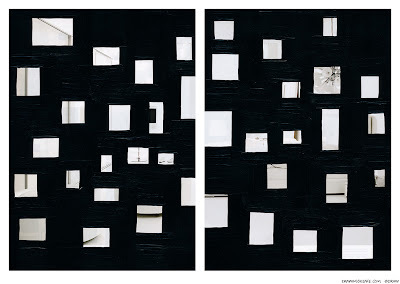 The work could simply be disregarded as not a sequence but merely a juxtaposition. 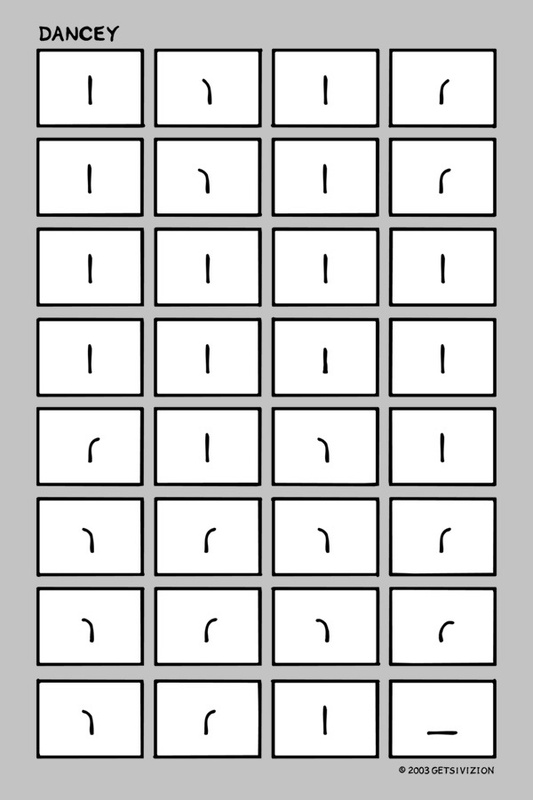 I decided to keep my focus on what I considered logical sequences. For me this meant sequences centered around movement and or progression. Movement intimidated me at first so I focused on progression. I had been been working on many solitary image abstract drawing at the time and I noticed I would fall in love (pardon my romanticism) with the drawing at various stages of its completion. My very first abstract comics centered around this. 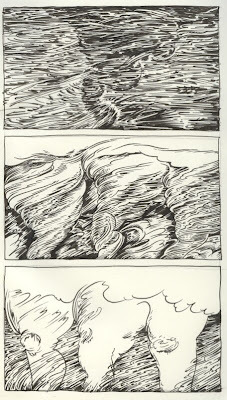 I would scan in the drawing at various stages and then put the images in sequence. 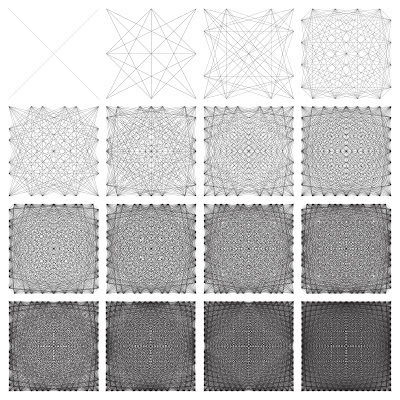 The viewer sees the image being built little by little in each panel. It's when I started working digitally that I was able to embrace movement and the combination of movement and progression. 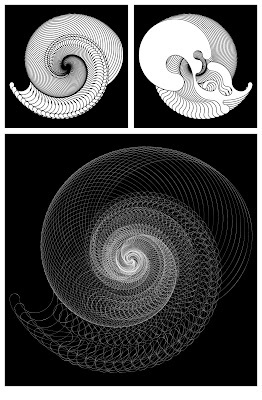 Working in a vector based program allowed me to make an image and literally move around or change various components of that image. For me comics are very much about storytelling. My stories instead of being about characters with personalities are about shapes or lines moving, changing, and/or multiplying. The life of a composition if you will. I believe that comics are more than an aesthetic or genre. Panels, gutters, and word balloons do not make a comic. It is sequence and readability that are the true nature of comics. 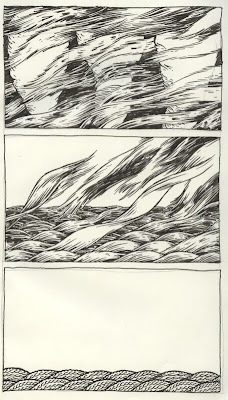 If one looks at an abstract comic, or any comic for that matter, as a single composition they are not doing it justice. Comics are by nature a sequence of separate but related images. They are meant to be read rather than simply looked at. I am very open to discussion of my ideas and/or work, if you have the slightest inclination please contact me. 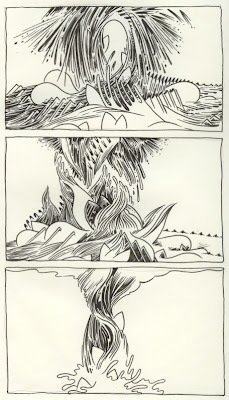 Also check out my comics (abstract and other) blog at whatcomics.blogspot.com. 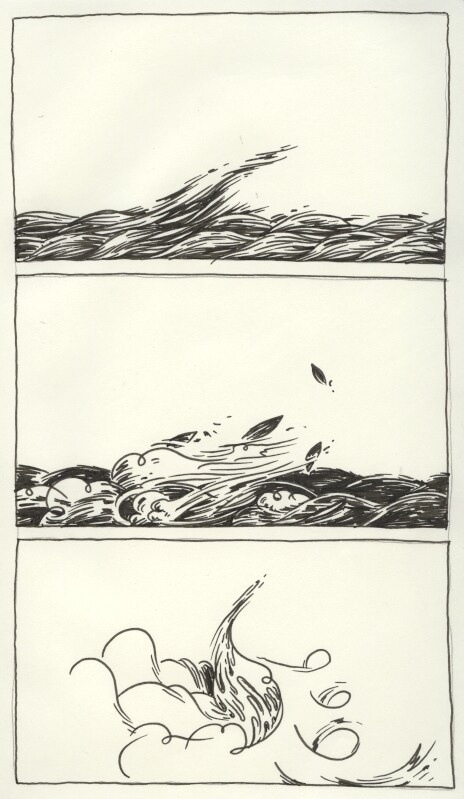 Chris Kreuter published his abstract comic book, "Stray Thoughts," in 2008. I discovered his work too late to be able to consider it for the anthology. I was interested in finding out how he came to abstract comics, what his influences were, what the concept was behind the pieces he has made so far, and what new projects he is working on. 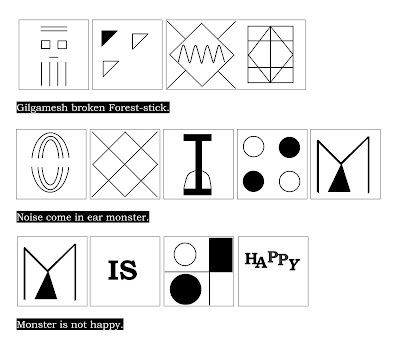 Here are his answers, together with some images from "Stray Thoughts." This is the first in a series of interviews with abstract-comics artists of whose work I learned only after finalizing the roster for the anthology. of comics? This is how the idea developed for "Stray Thoughts." they’re taken outside of their comfort zone. as innovative as I thought I was. book and give it its own unique identity. envy all the cartoonists who have the skill and patience to do this. More of Chris's work can be found on his website, www.chriskreuter.com. Separately the pieces can be seen here and here. 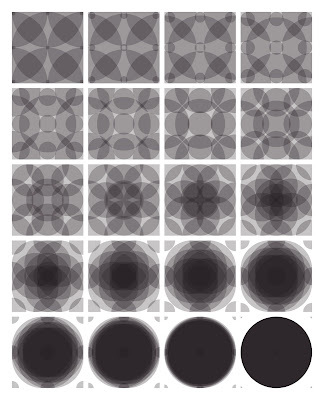 I like the idea of fracturing modernism. 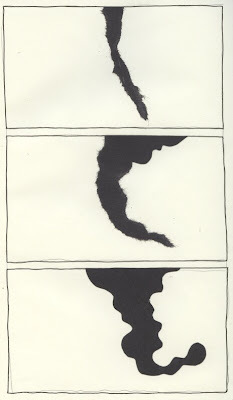 Here's an abstract comic; quick, who is it by? 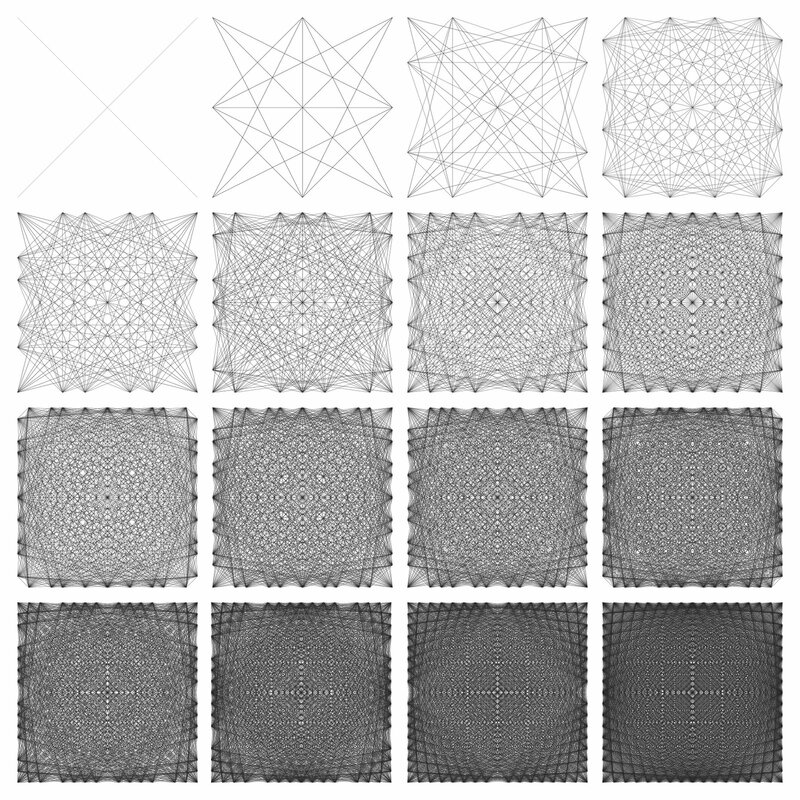 Here we are, fifteen years in UC's future, and some of the possibilities of evolution that McCloud predicted have taken place, some of them on this very blog; and quite possibly because of that very prediction. Brief review of the anthology at We Love You So, a blog mainly dedicated to "Spike Jonze’s feature film rendition of Maurice Sendak’s classic story Where The Wild Things Are." Makes a weird kind of sense, actually. Robin McConnell of Inkstuds interviewed me by phone all the way from the wonderful faraway land of Vancouver, B.C. Listen to the podcast here (believe it or not, this was even broadcast on a number of real live, non-internet college radio stations!). And, oh yes, please enjoy my musical selections. I got to play DJ for once and, well, that's what I came up with. Oh, by the way, please do let me know what you think. I don't know if I can stand the sound of my own (recorded) voice for long enough to listen to it.